So in the past I had written some blog posts that I just simply titled "Brewery Update [insert date]" and while that was appropriate, because it was an update, I want to try and better categorize any and all update-type posts in the future. I also want to try and label posts with appropriate tags to be able to search my growing list of posts better. I am deeming these smorgasbord posts as Brew Thru's. I liken this much to the growing youtube tag Homebrew Wednesday (HBW). If you aren't aware, HBW is the acronym people use when they make short videos every Wednesday and post the video on youtube. These videos usually feature a guy tasting a beer and giving any updates related to their homebrew gear or gadgetry. They can be very entertaining, however, only 5% - 10% of the video provides informative information. I hope to outline these updates in a way which allows readers to quickly skim and extract any informative content they may find useful. Without further ado, lets brew thru! Sui Generis Brewing - Homebrew blog with a focus on yeast. The author has developed a great series of youtube videos for the beginner in yeast culturing and working in an aseptic environment. If you are interested in start a small homebrew yeast lab, definitely check out this site. Eric Brews - This is somewhat of a new blog created back in November to document the brewing of a ton of beer for the authors coming nuptials which are this weekend, I think? I stumpled upon Eric's blog doing my semi-weekly google searching for "induction" or basement brewing setups. Eric is using the avantco burner, too. I am hoping his blog stays frequently updated once his marital status changes. Shegogue Brew on HomebrewTalk - I have written a few articles and plan to write some more for the popular online homebrew community. I have also provide a link to the right specifically for my posts. I will try to plug them through future brew thrus. Has your significant other every told you that you brew to often? If not, you may not be brewing enough! If so, I may have found some rationale for you to justify how infrequently you do brew, in comparison... thanks to Matthew Murray. Matthew is a homebrewer from NC who has probably been brewing more often than a lot of commercial breweries. He started a website to document his journey of brewing a beer everyday for an ENTIRE YEAR. Matthew is a little over a year into this and posted a new idea which I haven't seen before. 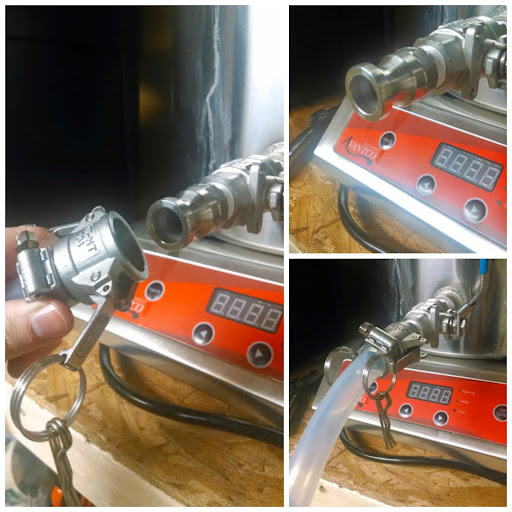 If you are a small batch (1-2 gallon) brewer, his tips on bottling are must see will definitely speed up your process. I have been using a new 9 gallon Bayou classic (1036) pot for my last 5 or so brews. I made this kettle change in my anticipation of going electric. The 15 gallon aluminum pot I used to use was not induction capable. The new pot came with a ball valve, and although the pain of cleaning and sanitizing my autosiphon is now relegated only to packaging day, I learned the hard way how messy it can be to try and get wort from the kettle to the fermenter with just a ball valve. I decided to solve this issue and future-proof my kettle by ordering a set of camlcok quick disconnects and silicone tubing from brewhardware.com. I used the setup to drain from my kettle to a Better Bottle on Monday when I brewed and it worked like a charm! Yet another small step in my constant goal of brewday time optimization.